360° rotation increases efficiency, allowing operators to work up to 12 times faster than with a conventional ratchet lever hoist. Crank handle made of durable polyamide with a heavy-duty steel core for rugged use. Easy and effective operation from any angle with handle that folds down and locks into position on either side of the lever. 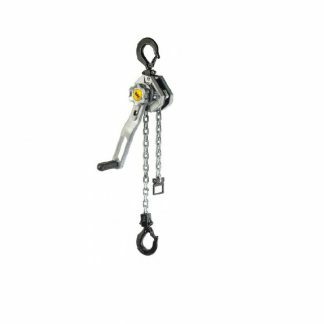 Design keeps the operator’s body aligned with the load chain, reducing the risk of the twist effect – when a hoist twists around the chain. No need to use a second hand to stabilize the hoist. Requires 30% less effort to operate.